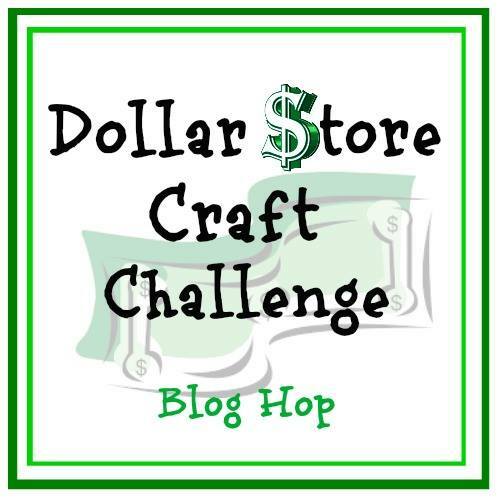 When Laurie suggested a Dollar Store Craft Challenge, an idea immediately popped into my head. 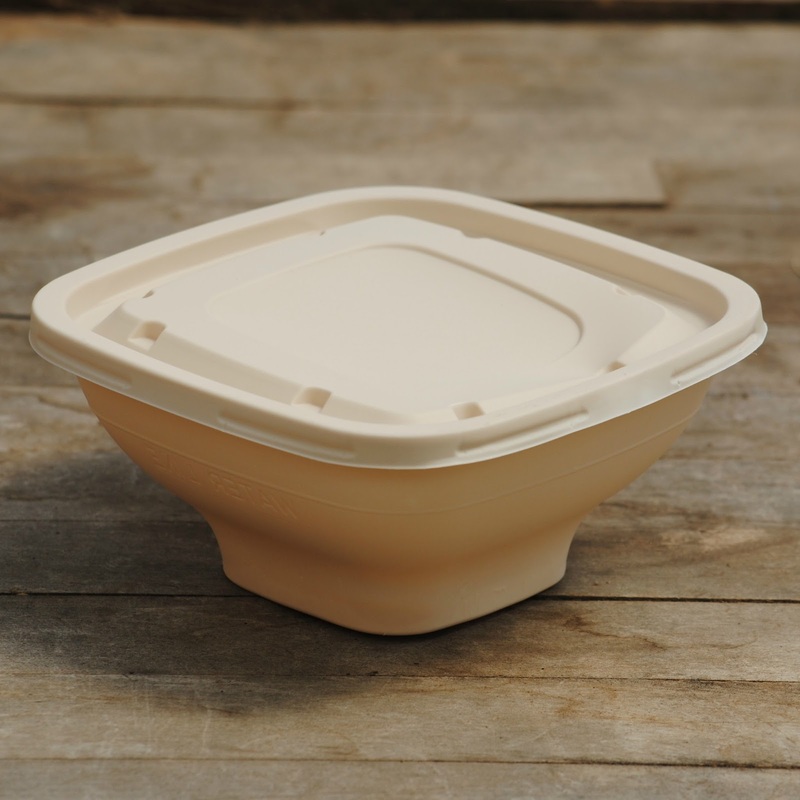 If it's a flop, the expense is minimal. I've wanted one for quite some time, but didn't have confidence in my ability to execute. 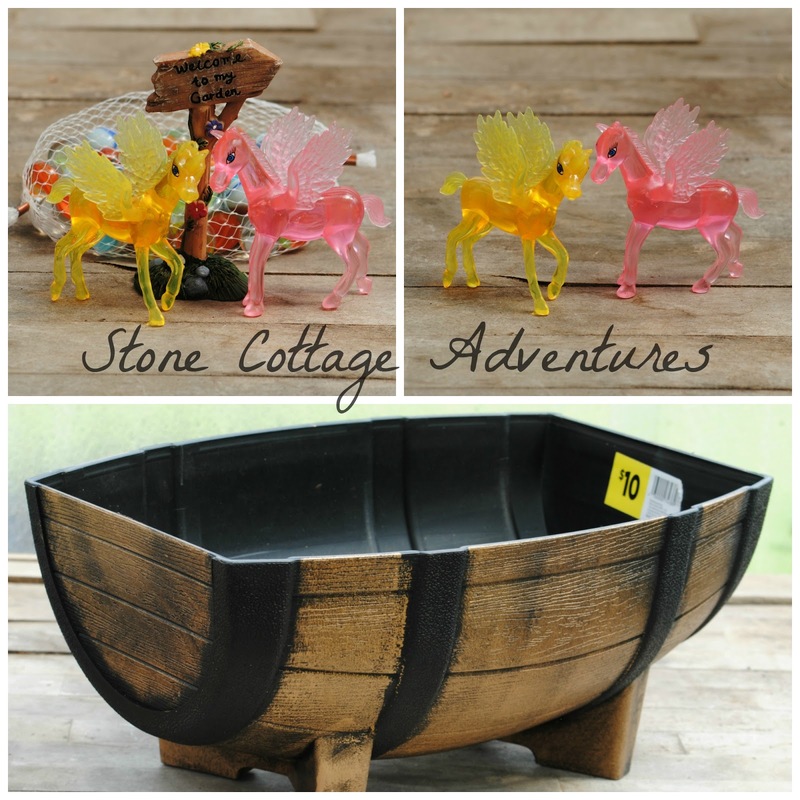 Here's what I chose for inspiration: Adorable Pegasus Toys, a small "Welcome to My Garden" sign, marbles, and this half barrel planter. My total was $13.50 plus tax. You can see $10 was the price of the planter. Isn't it CUTE?! I may go back and get another planter. These are the perfect size for the table on our back porch and the vintage vibe is great for our old rock farmhouse. Next big decisions were plant choices. I purchased asparagus fern and purslane in an "end of season" sale for half price. Viola and moss were swiped from around our yard. The taller plants were placed at the back and side, with the creeper in front to drape over the edge. I used the moss as a cover for the soil, really just piecing it together like a quilt. 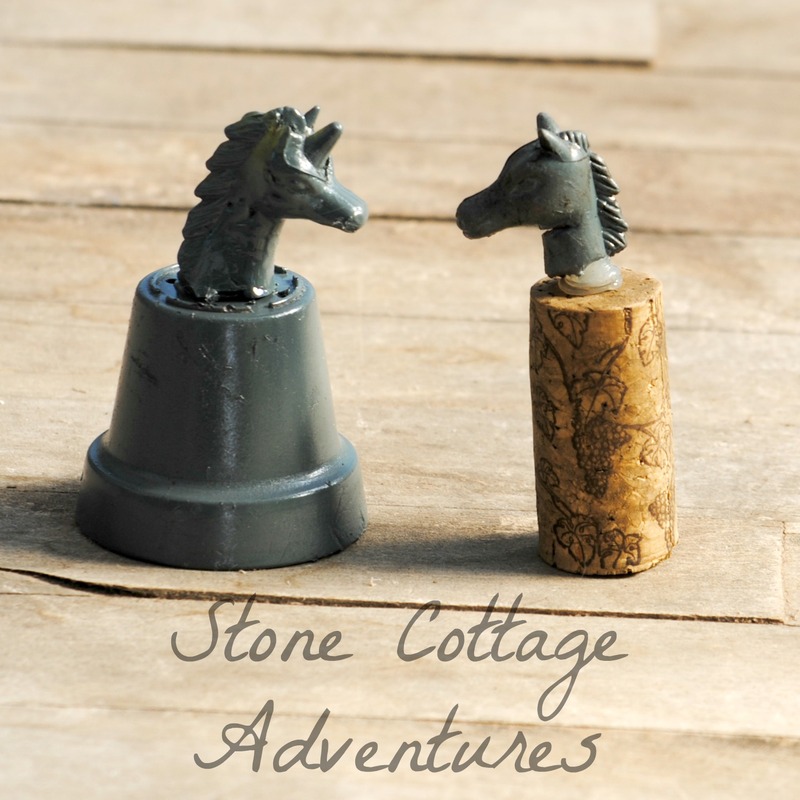 I wanted the horses to look less like toys and more like statues, so they were placed on a stump in the back yard and given a quick zap of gray spray paint. When it was time to flip them over and spray the other side, they were gone. Labrador puppies may have been involved in this crime. Hoo boy! It's a good thing they are cute. I could have wrung their adorable necks. No worries, though. This story still has a happy ending. The heads became garden statues! Bite marks add character, right? ;-) Both were cleaned, painted gray and hot-glued to small pedestals. One base is a wine cork and the other is a tiny plastic seed starting pot. 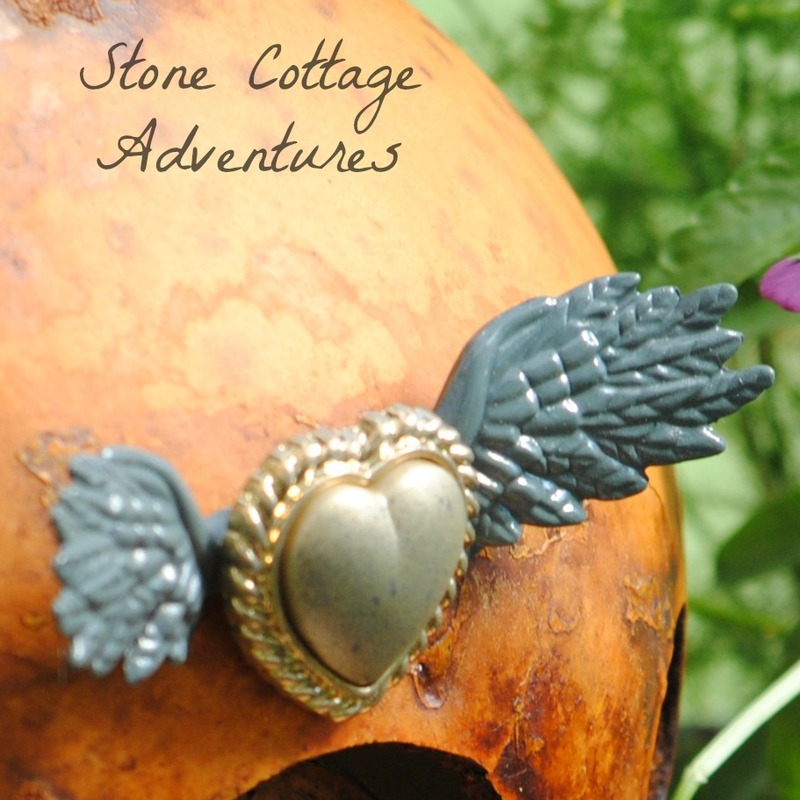 The wings were hot-glued to the back of a button and hang above the fairy's front door! I gave the button just a bit of gray overspray to make it look speckled and feel vintage. This plastic tub is recycled from one of those 'just add water' meals. 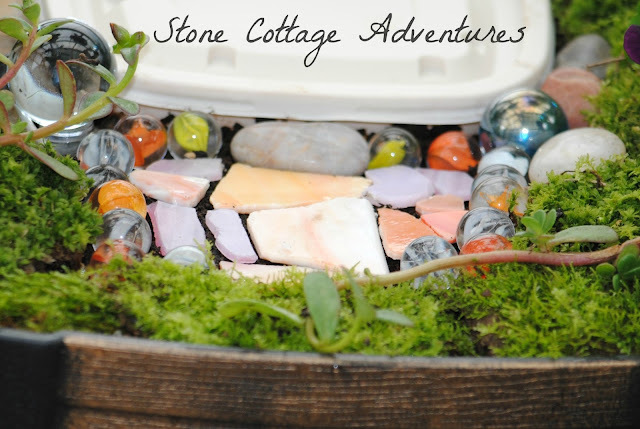 It's perfect for holding the fairy house up from the soil and moisture. After washing, the lid was covered with green fabric to help it blend with the moss. Marbles outline the patio and are dropped here and there for a bit of shimmer. 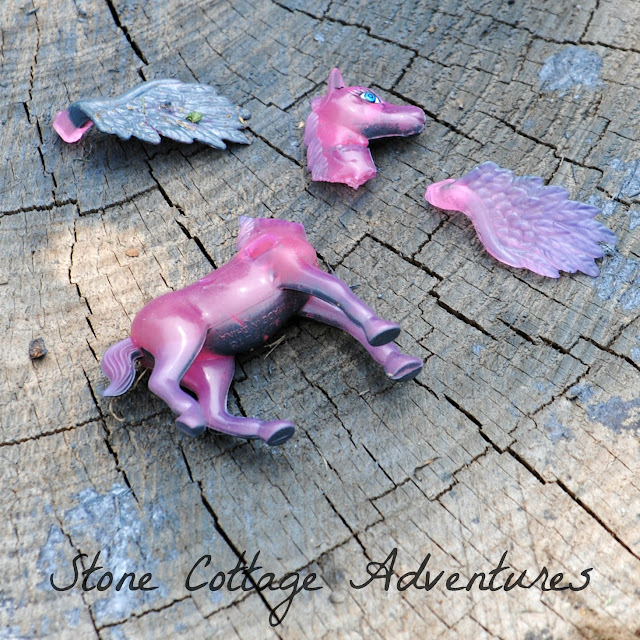 These colorful broken tiles and polished stones were already in my stash. Don't they make a lovely patio? My cute little sign is snuggled against the fern with a couple of shells. From there, whatever struck my fancy, like a tiny watering can, was placed around the garden. My inner child is ridiculously happy with this project! 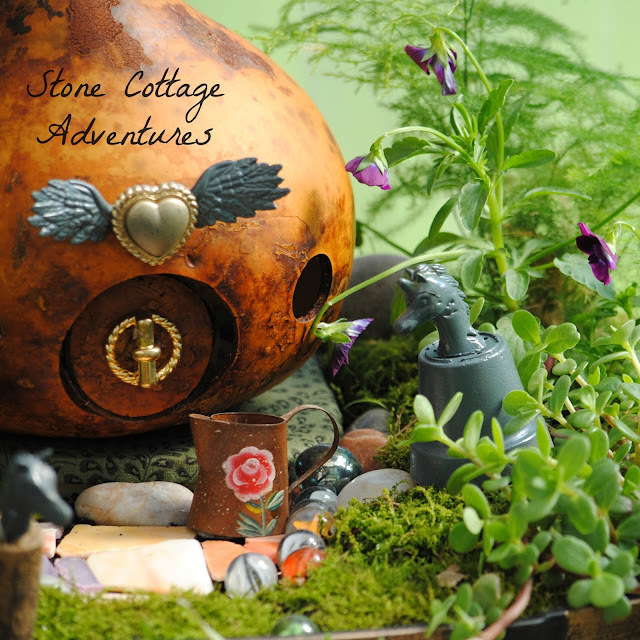 I'll be publishing a post about how I created my fairy house from a gourd grown in our garden. 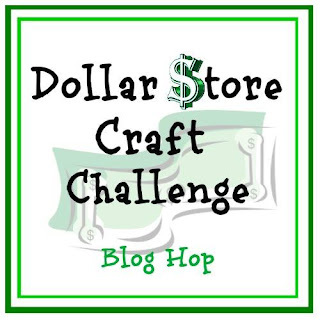 Have you ever looked for inspiration from a dollar store? Edit June 24: You can find the tutorial for the Fairy House HERE . Wow, Marci! 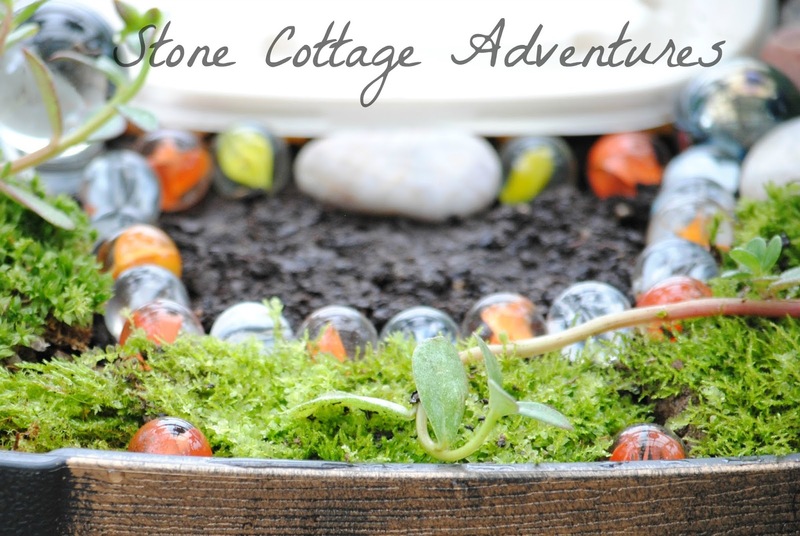 You've really outdone yourself with this adorable project! It's so wonderful! How fun! I love fairy gardens. Yours looks great. That was a clever way to salvage the toys after your dogs decided to play with them!The gourd looks great, too. Pinning. Oh Marci, this is just adorable. Your inner child should be very proud of what you did here. I cannot believe you were hesitant to try this. 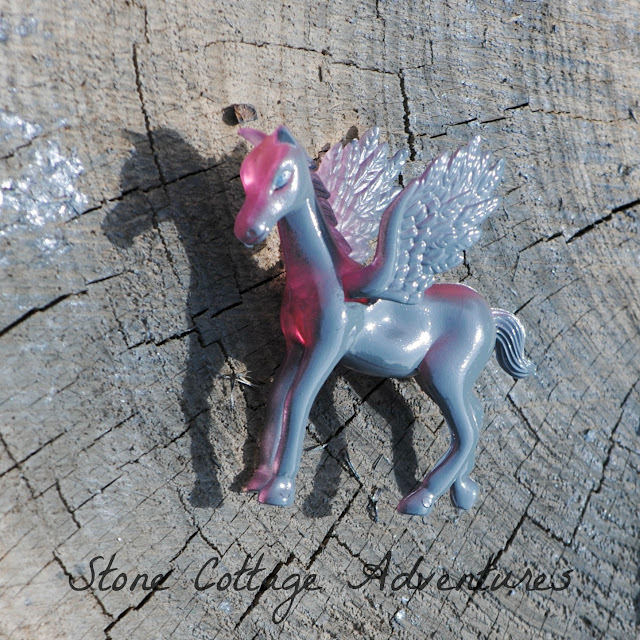 It is a masterful job, with loads of pretty little details that really make it a special fairy land. Oh Wow Marci, this is so awesome! What a fantastic job you did! Love it! How fun! Love this idea. They would be cool to make as gifts. Oh my goodness, this is adorable! Such a creative and clever use of dollar store finds. Magical! How cute is this and SO much detail it makes you want to shrink so you can get in and walk through it all! This is so whimsical and adorable. You totally captured the essence of a fairy garden. Most impressive. Super cute! 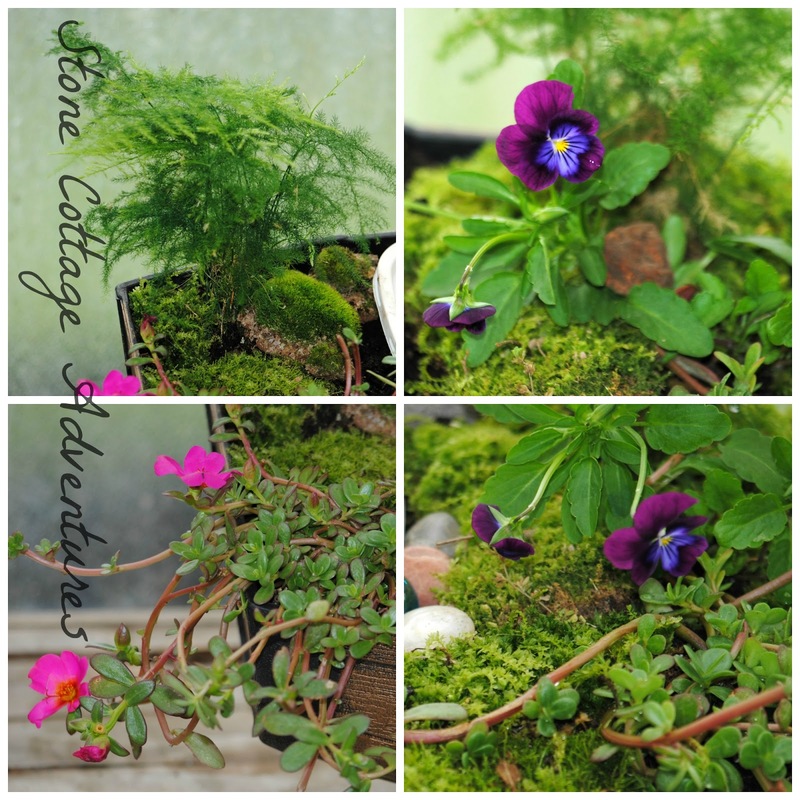 Love the garden ideas, great gifts. So clever, I love fairy gardens, I have yet to put mine together!!! I can see you enjoying updating this as each season rolls around...you've got a great base...maybe little jack o lantern at Halloween? a Turkey at Thanksgiving? Fun project. Just darling! I love that. I love your fairy garden! I'm hoping to do a new one this year and you've motivated me to get started. So cute! I need to get my daughters in on something like this! 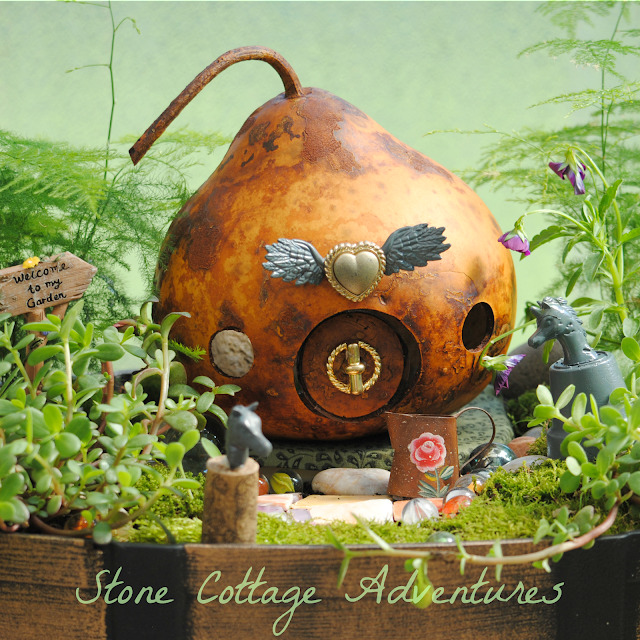 Adorable, great idea using a gourd for fairy house. Love how it looks, did you stain it? 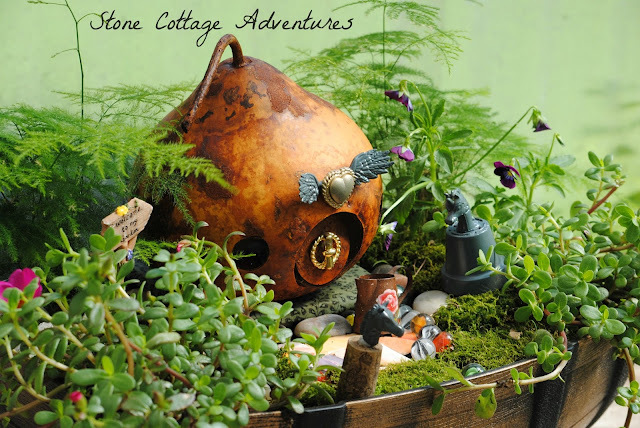 The cute decorations are so perfect on your fairy house. 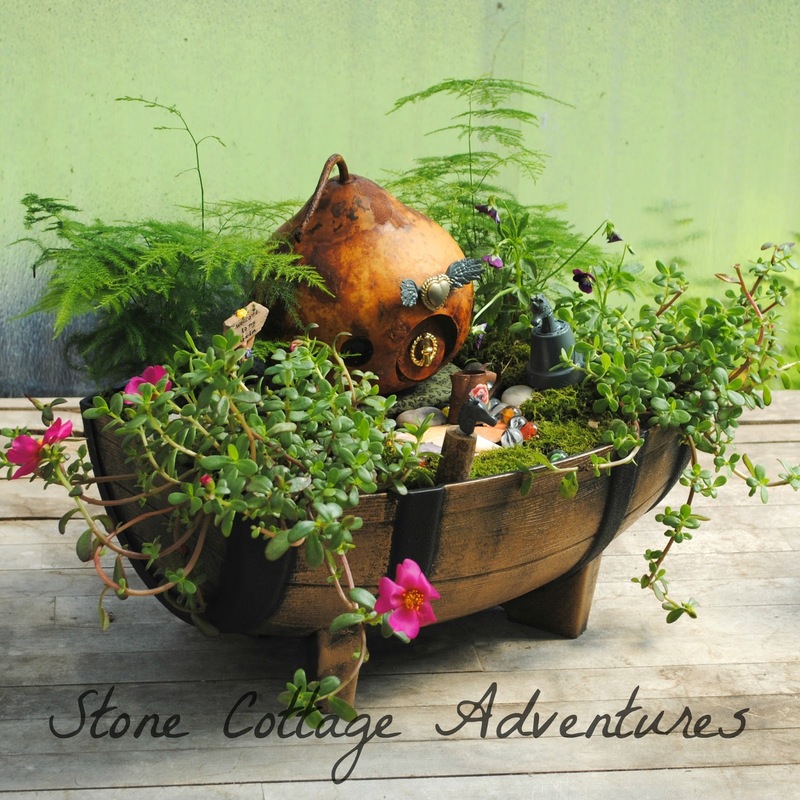 That little planter looks like garden is in a little boat, so cute and another smart idea. I used 2 different shaped bird houses with thatch on roofs for my fairy houses, got some little accessories at Joanns and Big Lots. Have some wood spindles from a mill put little bunches of flowers In them. 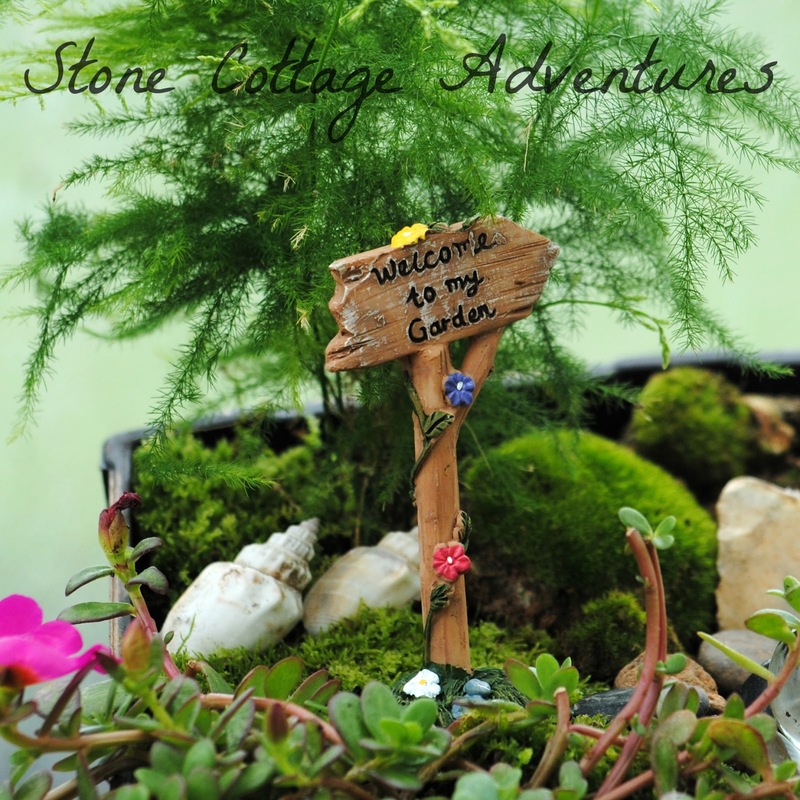 Isn't it fun to make fairy gardens? I love the door on your gourd fairy house and how you incorporated the poor puppy massacred horse pieces into your design. My daughter and I are avid fairy gardens. I'll be pinning this post for future inspiration! Aw, this is such an adorable fairy garden. It doesn't look like a dollar store project at all. Love what you did. Very cute! My girls would adore something like this. Thanks so much for sharing at the #happynowlinkup! That's so pretty and cute! This is too cute Marci! I absolutely love it! I have always wanted to create a fairy garden in the old house garden so that is definitely on my list! I have built one with a class of mine once and that was so much fun. Thank you so much for linking to ~MyGloriousGardens. I hope to see you next month.